Today, I went running with my virtual running buddy. I've been using my Garmin Forerunner GPS / heart monitor since 2005, but I've never used the running buddy feature before today. It's a cinch to configure - you just tell the unit what pace and how far you want to run. During your run, you can see how far ahead or behind you are compared to your running buddy. I'm a big fan of using heart rate monitors during runs since it'll tell you your exact effort level. If you're sick or not well hydrated, that info will reflect in a higher heart rate compared to a typical run. My resting heart rate is average: 65-75 beats per minute (bpm). 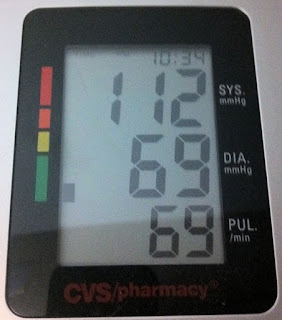 But, my max heart rate has always been high - well over 200 bpm. Today, on the long, steep, uphills around mile three of my four mile run I pushed my heart rate up to 207 bpm, yet I still kept falling behind my running buddy. I had built up a solid one tenth of a mile lead at the beginning of my run knowing that the uphills were coming, but I ended up giving back all of my lead, plus I fell behind my running buddy by a tenth of mile. Luckily, the last three quarter miles of the run were down hill and I managed to sprint it and beat my running buddy by about 75 feet. When I first started using a heart rate monitor in 1995 I was concerned that my high max heart rate was an issue. But, it turns out that it's not. Just like a person's height, your max heart rate is mostly a factor of hereditary. Statistically, your max heart rate will drop about one bpm/year as you age throughout adulthood. However, your resting heart rate is a factor of fitness - so, the better shape that you're in, the lower your resting heart rate. Less heartbeats equals a longer life - all things being equal. Don't Forget Your Pilot's Guides!